When you are inside a movie theatre, the world could end and so long as the movie keeps showing, you'd not know it until you walked outside. Such was the nature of last Sunday. Pam and I went to Brave. There was a 40% chance of rain but that just means 40% of the area gets 100% of the rain. The temperatures were to approach the upper 90's again and Com Ed was announcing record power consumption figures. Hence, when the power went out in the movie theatre, we weren't exactly sure if this was something with the theatre, a brown out or perhaps weather. Pam thought she heard rain, but, again, is it rain or is it something in the movie. We didn't know, for sure, until we walked to the front of the theatre and exited. The parking lot was wet. There were standing puddles and there were leaves and twigs scattered about. To our left, the dark clouds of a passing storm were heading east southeast toward Indiana. "Hmmm, looks like we got heavy rain. Do you suppose it was heavy enough to knock out the power?" Power was out at one stoplight on the way from the theatre to Culver's for lunch. We had a delightful lunch and continued to head west. When we got into Glen Ellyn, the light at Park and Roosevelt was flashing. No matter. We'll go cross-country. I wanted to hit CVS Pharmacy before going home as I needed refills on Folic Acid and Methotrexate. As we headed into the neighborhoods to avoid Roosevelt Road, we started seeing signs that perhaps this was a heavier than we thought storm. There were limbs down and lots of debris clustered around the storm drains. CVS was closed due to no power. "I'll wait. You run inside and tell me if you have power," Pam said, as we drove down my street and passed a neighbor carving up the remnants of the tree that had blown over in his front yard. Nope. I had no power. Pam headed home to see what awaited her. 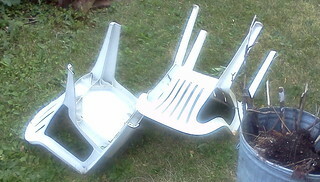 Wheaton was one of the hardest hit communities. The storms formed roughly 30 miles west of us, just popped up, without warning, and roared east, "roared" being the operative word. We've been told "hurricane-force winds" of 80-90 mph came with 1-2 inches of rain in 20 minutes. We often joke that getting from place to place easily in Chicago is a "you can't get there from here" adventure. Downtown Wheaton has and still has no power and lines down all over. Giant trees, probably in excess of 60 years old, were snapped, toppling onto power poles and lines, snapping them. Pam had a limb down in her back yard, balancing on the power lines and a limb down in the front. As Pam has a generator, I removed most of the fridge and freezer stuff I bought on Saturday (I know. Perfect timing.) and took it to her house. The damage was incredible. It's going to take weeks to get things cleared. My power came back Monday afternoon. Pam's is still not back on. People have been on the grid only to be removed because of another problem. Wheaton canceled all of their July 4th events because you can't get into downtown, where the parade goes, and the excessive heat and dry conditions do not bode well for fireworks. 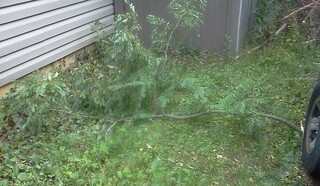 I have two branches down of this size. 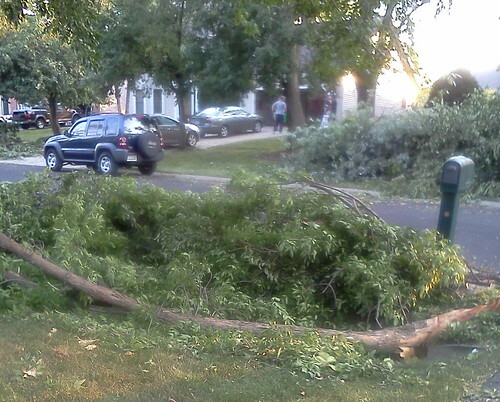 The city has announced they will pick up storm debris from parkways. I just have to drag this to the street. I am incredibly fortunate. I look at my tree shaded back yard and realize, it could have been so much, much, much worse than a couple of branches and the deck chairs tipped over. We gripe and complain because we are without power. When you drive by streets closed because the lines are dangling 2 feet off the ground, when you drive by homes where the tree snapped, hit the power pole and snapped that in three pieces, when you drive by streets where the only thing you see on each side are mounds and mounds of branches and limbs, you realize that this is not a 24-hour snap your fingers clean up. I must have passed a dozen power trucks and a dozen tree trimming trucks, some at work and some standing around the remains of a light pole and assessing how best to remove that branch safely. Last July's storm left me without power for about as long as this one did. It's hot. It's sticky. It's uncomfortable. But, I am grateful I did not suffer any major damage, just a minor inconvenience. We have become quiet used to our electrified lives and it comes as a system shock when that is interrupted. I am grateful there are people who work to restore power. I won't criticize the linemen, the guys in the trucks trying their hardest in 90+ degree weather to restore power.